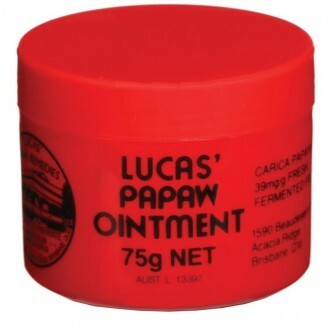 Lucas Papaw Ointment has anti- bacterial and antimicrobial properties. The beneficial properties of Papaw (Paw paw or Pawpaw) or Papaya fruit have been found to greatly aid the skin. Also provides temporary relief from the symptoms of dermatitis and eczema, and temporary relief of the discomfort of haemorrhoids by local application. NB: This product contains a petroleum base. A minute amount of Gum Balsam Peru is used as a perfume in Lucas' Papaw Ointment. Our commitment to quality is total. The manufacturing process is in complete compliance with the Code of Good Manufacturing Practice as administered by the Therapeutic Goods Administration (TGA). The ointment is prepared in an extremely clean environment to ensure it is free from impurities. NB: This product contains a petroleum base, as noted above.